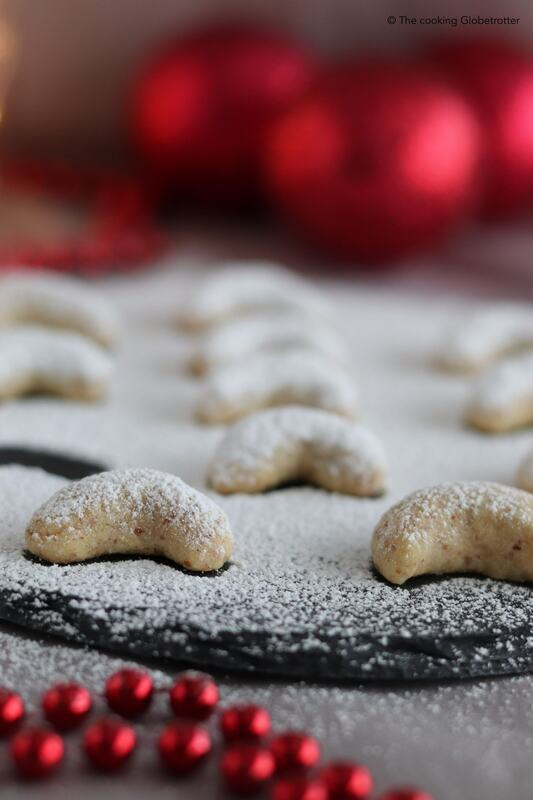 Christmas means for us Vanillekipferl: those buttery and nutty Christmas cookies are our favourites and we have to do them often as they all disappear too quickly! 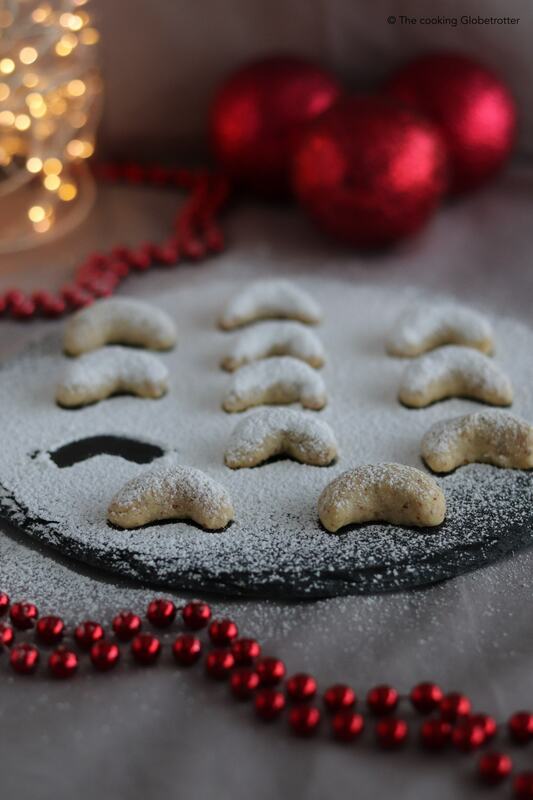 With this recipe, I am opening the 22nd window of the Foodblogliebe Advent Calendar: each day one of our amazing Food bloggers shared a recipe to sweeten up the countdown to Christmas! We love our Kipferl, literally “little horns” in German, with lots of nuts. You can use all kind of nuts, we prefer almonds (whole, with skin). 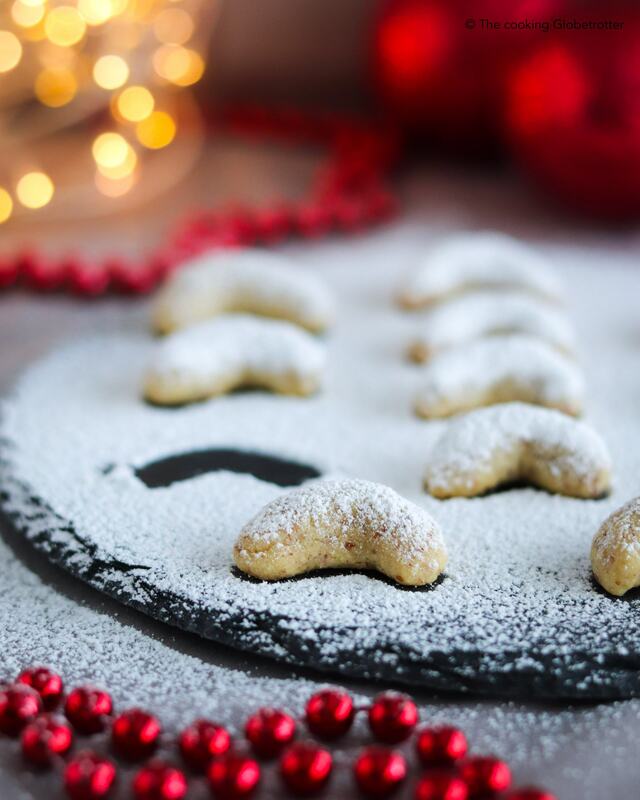 There are many different recipes, as this is a very traditional Christmas Cookie in Austria and basically every family has its own. Mine is inspired by a traditional and quite old cooking book from Styria, the region we live in, called “St. Martiner Kochbuch” (no affiliation). I adapted the recipe slightly and am sharing it here with you. Mix together 280g of plain flour, 210g of butter cut in pieces, 70g of sugar, 100g of good quality finely grated almonds, a teaspoon of vanilla extract and one egg. Let it rest in the fridge for 30-45 minutes. Heat the oven at 170 degrees. Take a piece of dough and roll it with your palms to form a cone with a diameter of 1 or 2 cm. Take a piece (2cm) and roll it with your fingers, then curve it and make it thinner on the edges. Place on baking paper and bake for 10 minutes. In a Bowl or plate put some icing sugar and drop the warm biscuits in (3-4 at a time), move them around gently with a spoon to let the sugar attach to the warm surface. Let them cool completely. Enjoy! Looking for something more fruity? Then check out my Coconut Macaroons!